Samsung has announced that it will now no longer plan to release a Windows RT device in the United States because of low demand issues for the scaled-down OS. In an interview aired on CNET at CES, the company said it was canceling its planned release of its ATIV tablet due to high cost and low demand. “When we added those two things up, the investments necessary to educate the consumer on the difference between RT and Windows 8 , plus the modest feedback that we got regarding how successful could this be at retail from our retail partners, we decided maybe we ought to wait,” Mike Abary, Samsung’s executive in charge of the company’s computer and tablet businesses in the U.S. told the network. 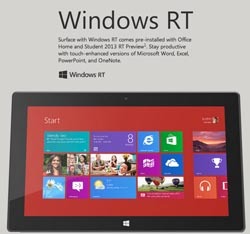 The issue with Windows RT is that it is a scaled-down version of Windows 8 specifically designed for use on tablet computers. The software is not as fully featured as Windows 8, and many consumers have found the difference between RT and Windows 8 to be confusing, especially as they try to compare options across a range of hardware. Samsung’s snub of Microsoft couldn’t come at a worse time for the Redmond, WA giant. Unlike previous versions of Windows software releases, Windows 8 has not created a rise in PC sales, and many hardware manufacturers are losing patience with Microsoft. Samsung has not ruled out an RT device for the U.S. market completely. Abary explained that they will revisit this issue at a later date.